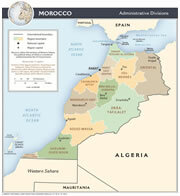 Morocco is located in northwestern Africa. 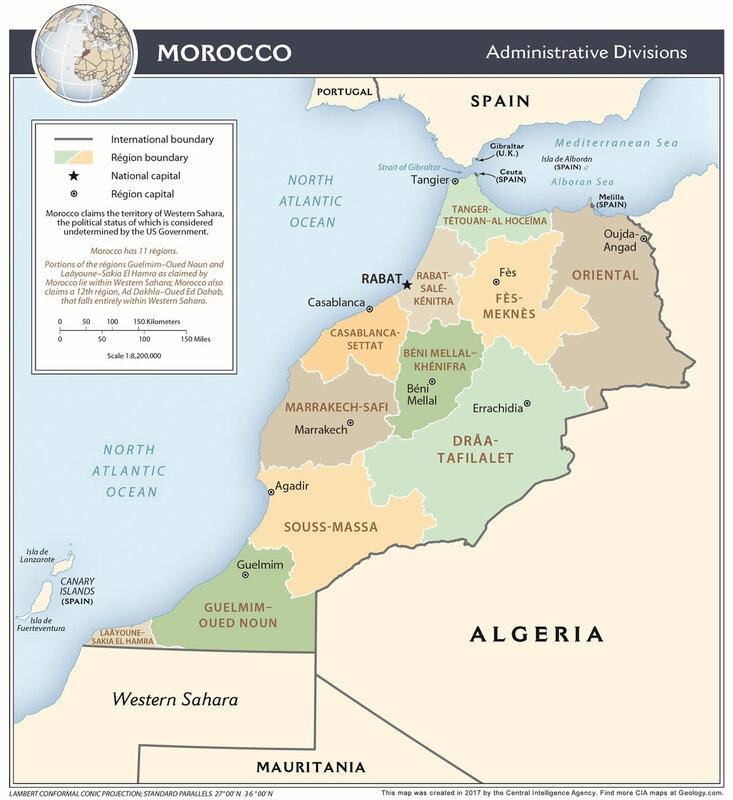 Morocco is bordered by the Atlantic Ocean and the Alboran Sea, Algeria to the east, Western Sahara to the south, and Spain (Ceuta and Melilla) to the north. 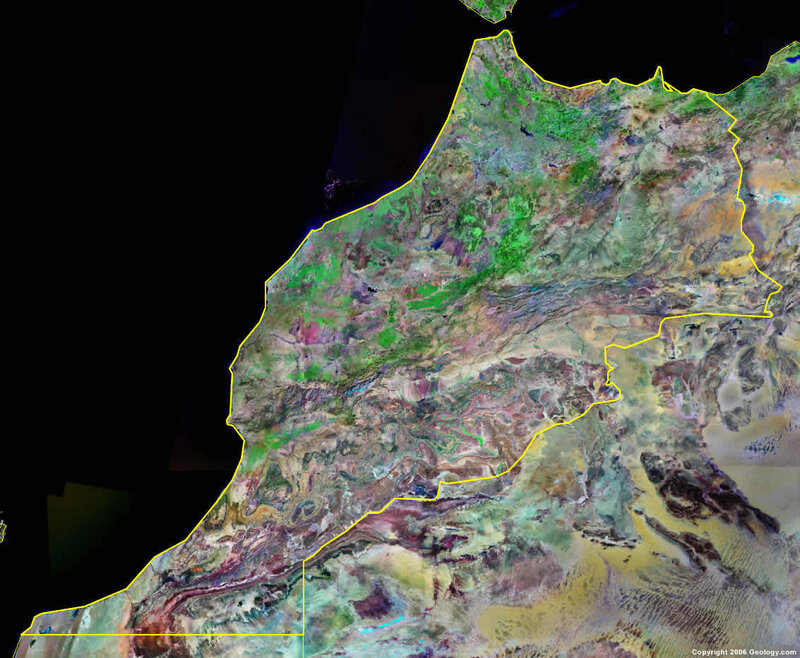 Google Earth is a free program from Google that allows you to explore satellite images showing the cities and landscapes of Morocco and all of Africa in fantastic detail. It works on your desktop computer, tablet, or mobile phone. The images in many areas are detailed enough that you can see houses, vehicles and even people on a city street. Google Earth is free and easy-to-use. 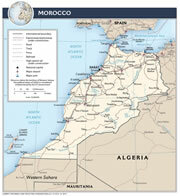 Morocco is one of nearly 200 countries illustrated on our Blue Ocean Laminated Map of the World. This map shows a combination of political and physical features. It includes country boundaries, major cities, major mountains in shaded relief, ocean depth in blue color gradient, along with many other features. This is a great map for students, schools, offices and anywhere that a nice map of the world is needed for education, display or decor. 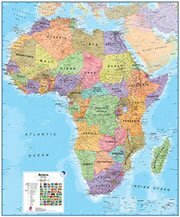 If you are interested in Morocco and the geography of Africa our large laminated map of Africa might be just what you need. It is a large political map of Africa that also shows many of the continent's physical features in color or shaded relief. Major lakes, rivers,cities, roads, country boundaries, coastlines and surrounding islands are all shown on the map. 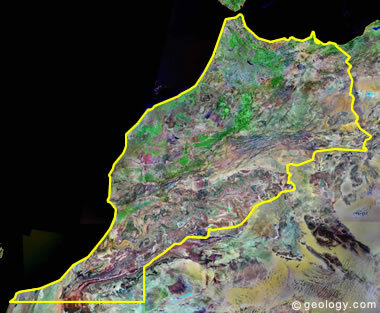 Alboran Sea, Anti Atlas, Atlantic Ocean, Atlas Mountains, Haut Atlas, Moyen Atlas, Oued Draa River, Oued el Abid River, Oued Guir River, Oued Moulouya River, Oued Oum Rbia River, Oued Rheris River, Oued Sous River, Oued Tensift River, Oued Ziz River and Strait of Gibraltar. 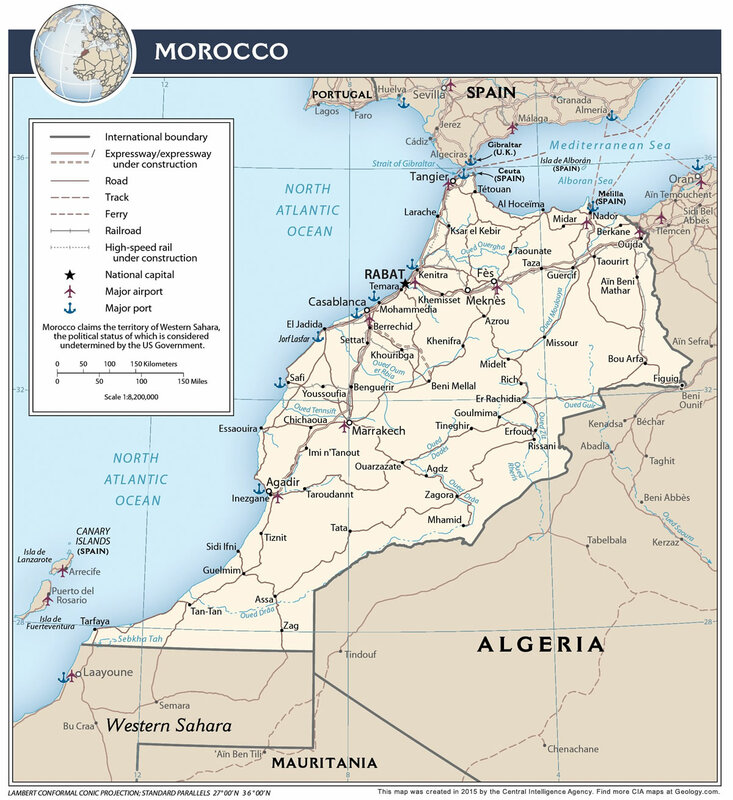 Metal resources for the country of Morocco include iron ore, manganese, lead and zinc. Other natural resources include fish, phosphates and salt. 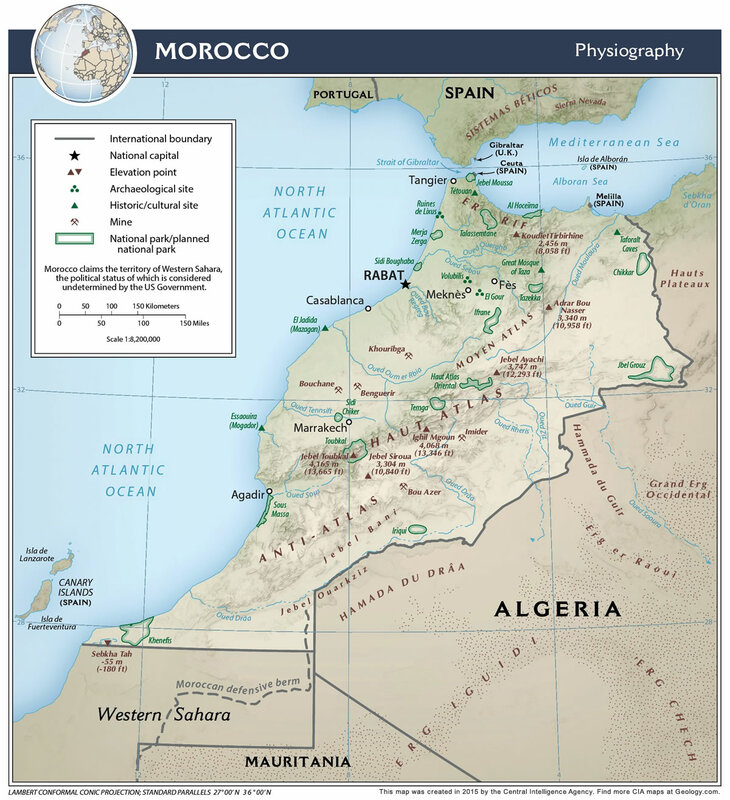 The northern mountains of Morocco are geologically unstable and subject to earthquakes. There are other natural hazards in this country, including periodic droughts. 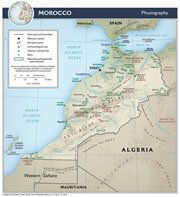 Environmental issues for Morocco are related to the land and water. These issues include the land degradation which is due to: overgrazing; destruction of vegetation; farming of marginal areas; soil erosion; desertification. The country's water supplies are contaminated by raw sewage and there is siltation of their reservoirs. The coastal waters have oil pollution.